Do you want the best possible microblading service in NYC? BUT, finding THE BEST microblading service in the city, one dedicated to excellence, customer care, education, follows all regulations, and has a proven track record you can verify is another task altogether. While Microblading does not require you to take out a 2nd mortgage, it is not a trivial purchase either. Your dollars are important, so a little caution is ok. Do your research. Ask questions. After all, it is your face we are dealing with here. This article is aimed at protecting your beauty as well as your time and money. In addition, these 5 signs of best microblading services can be applied to any microblading service in the United States, not just New York City. I want to state something upfront. This article is NOT to sell or convince anyone that my services are the best. Obviously, I am very proud of Better Brows & Beauty and would recommend my services to anyone looking to be treated professionally with great care and sensitivity. However, this article is written specifically to protect you, the consumer and my industry from others that may give it a bad name. There are many solid professionals in the microblading industry who love our craft, have passion for it and treat it with respect, and service their customers with great care. I simply want to help you locate those types of industry professionals, technicians, and microblading artists that will only increase the reputation of our craft and deliver to you exactly the service you deserve and are paying for. I want you to have an incredibly rewarding experience regardless of where you choose to have your microblading services completed. One last thing to note… PRICE is not the ONLY barometer for quality. You can pay way to much without improving quality. However, you will usually get what you pay for if you try to go the cheap route. In other words, If you are looking for the cheapest microblading, you will most likely not find the best microblading. Knowing what to look for while taking price into consideration is the best way to go. That is what this article is all about. First, a little information on microblading. Microblading has become a large trend in the beauty world. 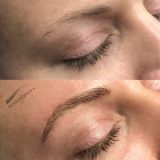 As a new form of eyebrow tattooing that creates hair-like strokes, to give your eyebrows a fuller, more natural look, microblading has become the most popular technique. If you’re considering getting the procedure, you need to find someone you trust with experience and all proper certifications. While there are ways to remove microblading after the procedure is completed, none are quick and easy. You want to make sure you get it done right the first time to avoid unflattering results and additional expenses. Microblading is not the best treatment for all skin types. You will want an artist that can guide you if microblading will work for you, or if another technique would be the best for you and your skin type. If you have very oily skin, or very large pores, microblading may not be the best for you. It’s imperative you find a microblade technician who is qualified, as it is a complicated procedure and could be harmful if done the wrong way. There are many across the state of New York who promote this service, but you need to be wary. I’ve seen the service promoted in unusual places and I’ve heard many unfortunate stories. Not everyone promoting microblading is a legal technician, so it’s important you do your research. Unfortunately, the industry is not heavily regulated at this point, which results in many people that are under-qualified opening up for business. Just because a business is online or on main street doesn’t mean they are qualified. Microblading can be nerve racking enough, make sure you are eliminating any risk by looking for these signs of excellence. Microblading is an advanced eyebrow technique in the permanent makeup industry. Regulations vary from state to state; however, all technicians must have completed at least a fundamental of permanent cosmetics course as well as an advanced microblading technique course. All technicians must also have a tattoo license issued by the state. Even though microblading fades as it ages in the skin, the Department of Health and Mental Hygiene still classify it under the same regulations as permanent makeup and tattoos. Because the skin will be opened during the procedure all protocol needs to be followed to prevent the spread of blood borne pathogens. All technicians must complete an OSHA training program. There are two agencies in the United States that test and certify permanent makeup professionals. 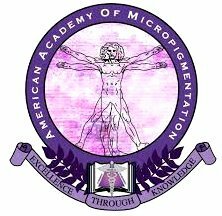 The Society of Certified Cosmetic Professionals (SPCP) and the American Academy of Micropigmentation (AAM) are the only two licensing bodies. Make sure your professional has a certification from at least one of them. Many people are taking a “2 day microblading class crash coarse” and begin working. 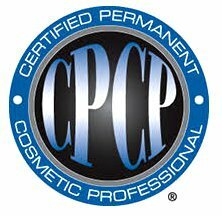 I highly recommend you make sure your technician complete thorough training and be a certified permanent cosmetics professional (CPCP). Experience is only developed after time and working with a variety of situations and hundreds, if not thousands of eyebrows. Someone could take many classes, but until they have worked on hundreds of eyebrows throughout the period of years, full knowledge is not obtained. An experienced microblading artist will know how the pigment will age in your specific skin type over time, and how to maintain the best look for years to come. Skin is a microblading artist’s canvas. Skin is completely different from person to person, and is always changing as we age. Ask your artist to show you healed pictures. You want to see how the work looks healed into different skin types. There are many people offering 2-day microblading courses in an effort to make a “quick buck”. Unfortunately, many of these students are leaving the course thinking they are ready to work on clients. This is simply not the case. If an artist is offering a price that seems too good to be true, they are probably too new at the craft to be working on clients. When hiring an experienced microblading artist, you are not only paying for the time during your appointments with them, but also the knowledge they have gained throughout the years to offer you the best service. Microblading is truly a less is more technique. If you want the best microblading, you want the best artist. In other words, you want an artist that has perfected this art before working on your face. All microblading and permanent cosmetic professionals must carry insurance. Insurance protects both the client and artist. Make sure that whichever cosmetic tattoo artist you choose is carrying all proper certifications, licenses, and is insured. The certification and licenses should be on display and visible in their place of business. If it is not visible you should ask the artist to see it. A professional microblade artist will have the ability to discuss details of the procedure and sound confident doing so. They should offer consultations, and be able to answer all of your questions. You should be able to reach your specific artist directly after your appointment if additional questions arise. If you choose a large studio with multiple artists, make sure your artist is willing to share direct contact information so you can speak to them if you have any questions. You do not want to be in a situation where worse-case scenario something has gone wrong and you can’t even speak to the artist again. A professional microblade artist should keep detailed notes and images of every client. Not only does insurance require proper documentation, but this will ensure your artist will know exactly what pigment and needles were used on you. After your microblading is healed and you return for a touchup appointment, decisions can properly be made based off what pigment and needle was used on you the first appointment and how it healed in your particular skin type. Proper documentation is also used for the safety of clients. Pigment and anesthetic lot numbers are recorded in the event that a client has a reaction, the supplying company can quickly be notified and recall all products from that same lot number. Communication is very important between the client and artist. Not only does the client need to completely understand the microblading process and healing, but they need to be able to direct their artist as to what they are looking to achieve. During your first microblading appointment a lot of time is spent on the design of the new brows. During the design stage the client and artist need to be on the same page so the artist can understand the client’s exact wants. This communication can be done verbally and visually. A client can verbally describe what kind of brow they are looking to achieve. A client can also visually describe what kind of brow they want through a couple ways. Clients could bring picture examples of brows they both like and do not like to try and express to the artist what they want and don’t want for their own brows. The artist can start to draw the shape of the new brows with a makeup pencil so the client can visually start to see on their own face the artist’s ideas. If a client typically wears eyebrow makeup on a day to day basis, it is helpful for the artist to see how the client see’s themselves every day. Maybe a client likes the shape they create with makeup and the artist can see what they like, or maybe a client does not like how they look with eyebrow makeup and it can give the artist a guide as to why the client does not like it. Reviews are an effective means of communication to tell whether the studio you intend to go to is professional. Check the studio’s website, or you might instead ask via other online forums, such as Google, Yelp, and Facebook. If there are a lot of negative reviews on a certain page, it’s possible your experience with them won’t be positive either. Use your gut judgment. Reviews are never perfect as there are always ways for competitors to write negative reviews as well as people that can never be made happy, but they are usually obvious. Make sure the reviews are specific to the artist you choose and not just a place of business. Every artist has a different style, personality, and bed side manner. Make sure that you are choosing someone that others have felt comfortable with and had a positive experience. Referrals are always the best. If you have a friend or acquaintance that has had microblading, ask them about their experience. If you like the way their brows look and they had a positive experience, most likely you will as well. Check if any of the reviews seem to be repeat customers throughout the course of a couple years. The best microblading artists will retain their customers as the years go on as they maintain the look of their microbladed brows. You ideally will want to find an artist that you will have confidence in for years to come. Lastly, if there are any negative reviews, see if the artist or owner has responded to those negative reviews in a professional and courteous way. This is a reflection of how you will be treated should a problem arise. All of these things should be part of your microblading decision making process. A big aspect of finding a quality microblade technician is whether or not they are clean! As microblading is a form of cosmetic tattooing, the area around the technician and his complete working environment should always be clean and sanitized. What is your 1st impression when you visit the salon or establishment. If you feel uncomfortable due to cleanliness, I would highly recommend hitting the “pause” button. If the environment isn’t well-kept, you have definitely not found the best microblading in NYC! If the business owner offers or provide their services from home, they are operating illegally. All microblade technicians in the state of New York need to have a New York State Tattoo License and operate legally according to state regulations which puts requirements onto their place of business. It is New York State Law that a single use pre-sterilized needle is shown to every client before the procedure. The client must also sign a release stating they were shown their individual needle. If your microblade artist does not do this, you should rethink deciding on that particular place of business. Gloves should be on to open the pre-sterilized needle and remain on the artist until the procedure is done. All artists must also properly dispose of used needles in a designated sharps container. The sharps containers are then properly disposed of to prevent the spread of any blood borne pathogens. Used needles should never be put into the regular trash. All pigment used should be put into an individual pigment cup to be used only on each individual client. Any excess pigment must be disposed of. Pigment should never be used on multiple clients or put back into the bottle. All surfaces used and touched during the procedure should be covered with disposable single use coverings. All products and tools should be disposable and/or sterilized between clients. Look for these coverings in the treatment room. Like everything else, it is important that you do your research and find as much information as you can on the studio you choose to go to. Their business profiles should look professional. People who take time with their website and take pride in how it looks will do the same with your procedure. Microblading is very noticeable when not done correctly, so don’t let it happen to you. Do your research, speak to fellow studio goers and ask their opinions. Do all you can until you feel comfortable with your decision. Speak with the artist before booking an appointment, or better yet schedule a consultation. See if the artist has received any press. If publications have written about them in confidence, it’s a sign they are a reputable microblading artist and place of business. Lastly… and this could be #6… Free Consultations are another great indicator. Every business owner can charge what they feel is appropriate, so i dont like to recommend price be a sole indicator, but offering a free initial consultation to make sure that both the technician and their working environment meets your standards and everyone feels comfortable just makes sense. This will give you a chance to make sure that personalities as well as conditions are a good fit for your needs. Meet your technician and talk to him or her. Ask questions. Remember, you are the customer. It is your face and your appearance at stake here. Make sure all of the above are in line so that your microblading experience is also the very best! I hope this was helpful Please feel free to contact me anytime with questions or concerns you may have.